Who believes in the God-of-the-gaps anyway? 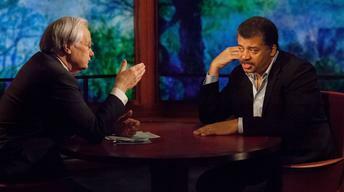 Bill Moyers interviews Neil deGrasse Tyson. Or so said Carl Sagan billions and billions of years… well, back in 1980, when PBS’s Cosmos became the most widely watched PBS series ever. The quote above, for example, which kicked off the original series was a metaphysical, rather than scientific, proposition. It was fine for Dr. Sagan to express his metaphysical beliefs, so long as his viewers understood that he was speaking metaphysically, rather than scientifically. No one was paying Sagan to be a metaphysician. What about Tyson? Will he make the same kinds of mistakes? Based on a recent interview Tyson gave to Bill Moyers, which Craig and Harris discussed in the podcast, they aren’t holding their breath. In fact, I’ve rarely heard the normally mild-mannered Dr. Craig sound so passionately indignant. When Moyers asks Tyson his opinion about the relationship between science and religious faith, Tyson says that “if you are going to stay religious at the end of the conversation, God has to mean more to you than just where science has yet to tread.” In other words, you can’t base your faith on the so-called “God of the gaps”—the God who explains what science is currently unable to explain. If you do, Tyson says, what room will be left for God once science fills in all the gaps in our knowledge of the universe? While I don’t share Tyson’s confidence that science is making such great strides, I agree that God-of-the-gaps is an insufficient reason to believe in God. Here in the real world, do many practicing Christians—or, for all I know, any practicing theists—really believe in God simply because he “explains” what science is unable to explain? I don’t deny that some people who believe in God have this kind of “faith,” but it certainly isn’t worth getting out of bed on Sunday morning. And so they don’t. Yet celebrity scientists like Tyson often talk as if most religious believers are like that! Be that as it may, Craig takes Tyson to task mostly over his assertion that reason is at odds with faith. At one point, Tyson says that since scientists can measure the “neurosynaptic firings when you have a religious experience,” God is strictly a product of the mind—which itself is contained within the cosmos. So Sagan was right: The cosmos is all that is, or ever was, or ever will be. There’s no sense talking about a God who transcends time, space, and matter. Now, Tyson is quite happy to say, well, God is just in your mind, and he thinks therefore you can give a neurosynaptic analysis of religious experience. Now, I would point out, Kevin, that my idea of Neil deGrasse Tyson is in my mind and you can give a neurosynaptic analysis of my experience of seeing Neil deGrasse Tyson. Does that mean that therefore he is illusory? That he is just an object in my consciousness – as you say, there is no external referent for that experience? Obviously not! This is a terrible argument! To think that because you can analyze neurologically my experiences of an object that therefore the object isn’t real or objective, that is a ridiculous argument and would ultimately lead to solipsism, right? The external world and everyone around me are all unreal and everything is an idea in my mind. I don’t know if Tyson is a solipsist but I would hope not. Then, having described this absurd position, he then starts talking about how he supports constitutional free exercise of religion. That’s wonderful, I’m glad he does. But don’t let it into the classroom of science. Well, where did that come from? How does defending the objectivity of God’s existence and that it is not just an idea in your mind lead to the claim that we are trying to introduce this into science classes. It is just guilt by association. He is blurring issues here. This is not representing clear thought, I think. To be clear, Craig mostly agrees with Tyson on “God of the gaps.” It’s that extra step Tyson takes—to assert that reason and faith are irreconcilable—that’s got his goat. Dr. Tyson: What he did was invoke – he didn’t invoke Zeus to account for the rock that he is standing on or the air he is breathing – it was this point of mystery. And in gets invoked God. This over time has been described by philosophers as the God of the gaps. If that is where you are going to put your God in this world then God is an ever receding pocket of scientific ignorance. If that is how you are going to invoke God. If God is the mystery of the universe, we are tackling these mysteries one by one. If you are going to stay religious at the end of the conversation God has to mean more to you than just where science has yet to tread. So to the person who says, maybe dark matter is God, if the only reason why you are saying it is because it is a mystery, then get ready to have that undone. Kevin Harris: Bill, I can agree with a lot of that. I think you probably can, too. Dr. Craig: Absolutely. He says that if that is where you put God, the undiscovered, then he is ever receding. God has to be more to you than where science has yet to tread. Absolutely. So what I want to know, though, from Tyson is for the person whose God is more than just where science has yet to tread, is that irrational? Is faith and reason irreconcilable, as he claimed? I do not understand that opening salvo against the rationality of religious faith. For the person who doesn’t believe in a God of the gaps, whose God is more than the God of the gaps, how is that person’s faith and reason not reconcilable? How is that person irrational? Nothing he said supports that opening bold claim. Instead, he has attacked a caricature. This entry was posted on	February 27, 2014 at 11:14 pm	and is filed under Uncategorized. Why do we need a “God of the gaps” to fill in the missing blanks? I think that sort of trivializes both the discovery process and God. If there is something that we need to put in, let’s keep looking. Also, where does the idea of good and evil fit within this discussion. I had a student one time say that as we discovered things, we would ultimately erase gods from the discussion because we would no longer use them as explanations for what we did not know. In this vein, once everything was know, there would be no need for a god (and I am deliberately using a lower case in this). But where does good and evil fit into all of this? Maybe God is not part of the discussion of how things come into being and how things are but how do you explain good and evil? And if you want to say that good and evil are part of one’s being, are you prepared for the discussions that come from that? You’re putting your finger on the moral argument for God, which is a powerful one. If good and evil have any objective meaning—one that isn’t an accidental byproduct of unthinking forces—then there must be a God. Everyone feels in the deepest recesses of their hearts, “This is wrong!” If a purely materialistic account of the universe “explains” reality, then “right” and “wrong” become individual tastes—it’s like saying, “I dislike coconut.” Some kind of evolutionary process may explain, in part, “how we got here,” but it can’t explain to anyone’s satisfaction what is good and evil. Nor can it explain why there’s a “here” in the first place. Or why we are so fortunate to live in a cosmos that is capable of producing and sustaining life. These are metaphysical questions. -what does Tyson or Dawkins say about the resurrection of Jesus one of the best attested events of antiquity? I could go on but here is where I should stop. Changed it… I agree with you. I’ve been saying many of these things on this blog for years. I often read scientific atheists saying things like, “You Christians don’t understand science” (never mind that many Christians are scientists and Christians, as you indicate, have made some of the most important contributions to science), but it’s not clear to me that we Christians misunderstand science any worse than most of these celebrity atheists misunderstand Christianity! I agree with you about the fact that many scientists are Christians (the reverse would not necessarily be true). The reason for my comment is to focus on the end of your comment where you rightly comment that many people really do not understand Christianity or science. The question that the faith community faces is how do we get people to understand what Christianity is and what it means to people. No matter what Carl Sagan might have thought when he first put together “Cosmos” and no matter what Tyson might think, their goal was and is to help people get a better understanding of what science is. (By the way, how did Tyson get the opinion of Christianity that he apparently has? If his understanding of Christianity is faulty, how did it get that way? And as I noted in my comment to “bobbob”, there are too many people today who have the “God in the gaps” view today and we see them every Sunday when we stand in the pulpit. The challenge has to be to help people find Christ and I don’t think that we are doing that great a job on that point. Some thoughts – I would agree with you on the point that those who hold onto the “God in the gaps” idea are on tenuous grounds. But then I think that many people in the United States fall into that category. As a group, we are quite comfortable being with God on Sunday and then putting him on the shelf for the rest of the week, only bringing Him out when we need Him. Won’t argue about Kepler being a stout man of faith (I would say that Copernicus, Galileo, and Newton were also the same). But it was church authorities that worked against the work of Kepler and Copernicus (primarily because of how they believed in reference to the church structure where they lived). Newton wrote more on theology than he did on physics and calculus but many people today would consider him to be, at a minimum, a heretic. About mathematical equations – as a chemist, that’s not my goal. The mathematics that I use are a tool to explain what is transpiring and what might happen. When you hear a theoretical physicist or cosmologist talking about “an equation”, they are attempting to explain a lot of things in the best way possible (borrowing, I believe, an idea from Paul Dirac). But this level of thinking is at the highest level of theory and intended to be an expression of the beauty and wonder of the world. Now, the other side of the coin is that there is a movement at the beginning levels to make the mathematics the actual and not an expression. Look at how students are taught and you will notice that it is often done without any reference to the world. It is very abstract and without form; it can be taught but it has no meaning. Things would be much better (my opinion) if we looked at the world and tried to figure out what was happening, not assuming that this is what is happening and memorizing it. I think you miss the point about what science does with its observations (by the way, observations have been going on for more than 500 years; how else do we explain the structures at Stonehenge and the medicine wheels on the plains of North America). Scientists are very aware of the limitations of their observations and very cautious about making statements that go beyond what they have recorded. Conclusions that are drawn from a set of observations are not faulty, unless the conclusion goes beyond the observations.. And when that happens, the scientific community will correct itself. What I have discovered in the years that I taught was the perception that science seeks perfection and if one does not achieve the perfection, it isn’t correct. But that would only work if we make one observation and then call it quits. But science doesn’t work that way. There are many observation so that one can begin to sense a pattern. In and of itself, science is not faith-based. If it were perfect, then it would not have any values to it. A discovery would be a discovery to be enjoyed. But the discovery that U-235 could fission lead to the idea of a weapon, not a power source. That’s the human element. Also, those who place their faith in science are dealing in science but in something called scientism, which is more a religion than a field of study. I haven’t figure out how to answer or respond to your last two points other than to say that each person has to view them from their own perspective and knowledge. In the end, we look to the skies and we wonder how this all began. We see pictures of nebula and galaxies and say “wow!” And in a couple of weeks, we will look to a hill overlooking Jerusalem and ask “why?” The answers that we get will come from what we do, not what others tell us. And if we let others tell us how to think or find these answers, we never will know the truth. you honor me with such a long response; I am sorry to take so long to respond. when i say science is rendering to mathematics, one could say chemical formulae are a kind of math: H2SO4 says something about the natural world with the same precision as E=MC^2. just as financial mkts look to the DJIA as some sort of indicator of economic health of the nation. it is a bigger, more complex problem than simple renderings. we are looking for the symbol that encapsulates the meaning of existence in whatever pursuit we find ourselves. so if you get this we could begin a dialog of some depth i should think.